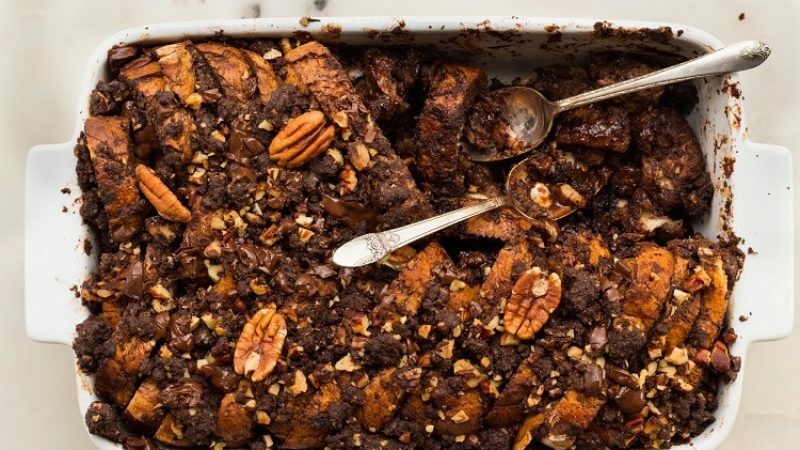 How can you go wrong by starting with a cocoa and vanilla custard and topping the casserole with a chocolate pecan streusel! Easy, hearty and delicious! Grease a 9x13 inch baking pan with butter. Cut the bread into 1 inch cubes. Spread half the cubes into the prepared baking pan. In a large mixing bowl, whisk together the eggs, egg yolks, milk, brown sugar, maple syrup, vanilla, cocoa powder, cinnamon, nutmeg and salt until smooth and combined. Pour 1/3 of the chocolate custard mixture over the bread in the pan. Add the remaining bread cubes to the pan and pour in the remaining chocolate custard evenly over the bread. Cover the pan tightly with plastic wrap and set in the refrigerator overnight - or for at least 4 hours. In a mixing bowl, whisk together the flour, cocoa powder, brown sugar, cinnamon and pecans. Work the cubes of butter into the dry ingredients with your fingers or with a pastry cutter until it is crumbly and clumps together when you squeeze with your fingers. Cover bowl with plastic wrap and set in the refrigerator overnight. The next morning, preheat oven to 350F degrees and remove the plastic wrap from the baking pan. Sprinkle with streusel topping over top of the soaked bread. Sprinkle with dark chocolate, if using. Bake for 45-55 minutes or until it is golden brown on top. Remove from oven and serve warm with maple syrup, or powdered sugar.